Rodstarz of Rebel Diaz stands on the roof of the Rebel Diaz Arts Collective in the South Bronx (JANET UPADHYE/The Bronx Ink). Rodrigo, aka Rodstarz and Gonzalo “G1” Venegas, members of the South Bronx hip-hop group Rebel Diaz, inherited a family history of struggle and survival. As children, they moved frequently because their parents, Chilean political refugees, never gave up hope of one day returning to Chile. “Half the time we didn’t even unpack,” said Rodstarz. “We were children growing up in exile.” But now, the Venegas brothers have found a home in the Bronx. Their parents were supporters of Salvador Allende’s socialist government. They became political prisoners when Augusto Pinochet launched a bloody coup on Sept. 11, 1973. After three years of torture in a Chilean prison, they were able to escape to England, where Rodstarz was born in 1979. G1, the younger, quieter brother, wears sunglasses inside the studio and has his hair up in a Samurai-style ponytail. “Only because it’s hot,” he said. G1 lays the beats and produces the music while Rodstarz grabs the audience with his stage presence and trenchant vocals. Their parents had a love for revolutionary Chilean folk music from artists such as Violetta Parra, Silvio Rodriguez, and Victor Jarra, whose hands were broken by Pinochet’s military to stop him from playing “subversive” music. And though their parents don’t understand hip-hop, their music provided a tenet for Rebel Diaz’s own sound: it requires a social message. Rodstarz and G1 have always had a love for hip-hop. At the age of 10, Rodstarz became a B-boy, or a break-dancer. “Every single day after school in Chicago I was break dancing on the roofs or in the parking lot,” he said, “My friends and I would set up some cardboard and be out there for hours.“ Eventually that passion for hip-hop would lead to Rebel Diaz. Rebel Diaz, the hip-hop group, was born in Hunts Point after G1 moved to New York City to study music engineering at New York University. Rodstarz came a few years later to record music with his brother who got free studio time through the university. Hunts Point had affordable rent, so that’s where Rodstarz stayed. “I was blessed to end up on the best block in New York City,” he said. Hunts Point became home. And from the start, they were a success, with several other New York City organizations asking them to perform for their events and music festivals. Within the first year they were hosted by international organizations allowing them to eventually tour in Spain, Germany, the Netherlands, Guatemala, and Chile. These tours solidified their appeal and allowed them to hook up with other Chilean political refugees doing similar work. The music was a vehicle to deliver their message but they also dreamed of a space for others in their community to be able to learn and create. They created the Rebel Diaz Arts Collective in the South Bronx (RDAC-BX) in November 2008 with money from the North Star Fund and a Union Square award. RDAC-BX is a hip-hop community center where young people can drop in to get political education and learn practical skills. They can create their own music with software like Pro Tools and attend workshops on topics such as the history of hip-hop and social movements. G1 of Rebel Diaz (JANET UPADHYE/The Bronx Ink). The front door is an extension of a skillfully graffitied wall. It leads into a spacious room with a red brick floor, comfortable couches, a stage, recording studio and roof access. Local music artists live in the apartment upstairs. Gonzalo Venegas and his brother Rodrigo have been rapping about social inequalities since the 1990s. Based in the south Bronx—the cradle of the hip-hop movement—the two brothers use the Internet to share their work with fans across the world. Known in hip-hop circles as the Rebel Diaz duo, the Venegas brothers blend hip-hop and Latin rhythms in songs about inner city youth, corrupt government and the problems faced by recently arrived immigrants. The sons of political refugees from Chile, their songs are often bilingual, with lyrics in English followed by a chorus in Spanish or an English verse punctuated by Chilean slang. The name Rebel Diaz is a take on the Spanish word for rebels, rebeldes. Raised in Chicago, the Venegas brothers have created an online community—and built a fanbase— using the most common web tools of the modern age: Facebook, Twitter and their own web site. On their Twitter account, they update their 1,500 followers about their upcoming concerts and share small snippets of their lives. Last Thursday, for example, the brothers informed followers they were watching their Chicago Bulls “put the bats” on Boston. On Facebook, the duo will occasionally share articles on civil rights protests with their politically conscious fans. But in other ways the Venegas are anything but typical web musicians. Rebel Diaz does not promote its work on digital stores like iTunes. Despite being relatively well known in hip-hop circles, the duo doesn’t do deals with record labels to market their music on the web. Instead, Rebel Diaz sells its material exclusively through its website, with tracks going for $1 and an album for $10. And unlike online retailers like iTunes or Amazon that only provide short previews of the songs they sell online, Rebel Diaz lets you listen to the whole track for free. You only need to pay if you want to download the song or the album into your computer. “Our experience as producers of music and consumers is that if people want to buy your music, it doesn’t matter if they listen to three seconds or one minute,” says Gonzalo Venegas, who goes by the artistic name, G1. The younger of the two brothers, G1 explains that the group makes most of its sales “hand to hand” after their concerts. He believes that most of those buying Rebel Diaz’s records online are people who were not able to get their hands on a CD after one of their shows. “Most people aren’t really hearing our music on our website. They’ll hear it on Democracy Now (a radio news show) or a friend will tell them about it, and at that point they’ll go to the site,” he says. The band’s web presence helps the duo promote itself and sell albums, but the brothers make no secret about the fact that they rely on live performances to make a living. Last year, the duo rapped at 100 shows. And in May, it kicks off a month-long European tour that will take it to Germany, Greece and the United Kingdom. For some extra income and to give back to the community, the Venegas brothers hold workshops on the history of hip-hop for students and youth groups in low-income neighborhoods. Click here for more stories on the Digital Bronx. at The Point, a non-profit cultural organization based in Hunts Point. Watch this video to see how it’s keeping hip-hop alive in the Bronx, where it all began. The history of rap music begins in the Bronx. Its neighborhoods are dotted with iconic sites of rap history such as 1520 Sedgwick Ave. where DJ Cool Herc first created the break-beat, or the infamous Forest Houses on 166th St. where Fat Joe grew up. Add to that list the “Big Punisher” memorial mural on Rogers Place and 163rd St. Though he died of heart failure over 10 years ago, the Grammy nominated Big Punisher, or “Pun” for short, still looms large in his native ‘hood on a wall that had special importance to him. 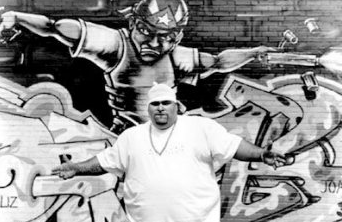 In his days as a budding young rapper, Pun posed for a promo shot in front of the same wall which was decorated, at that time, with a cartoon of a Puerto Rican gangster carrying two guns. Pun was a heavyweight in two ways. Literally, since some estimate that he weighed over 400 pounds, and musically, as the hip-hop giant of the late 1990s with hits like “Still Not a Player” and “It’s So Hard”. BG 183 remembered that it was one of the coldest days of the year but, despite the biting temperatures, fans and fellow rappers came out in droves to see the painting of the memorial. After the mural was complete things turned sour. For some reason, the artists involved in painting were picked up by police one by one.